The ‘Me’ of the title is Greg (Thomas Mann), an invisible high school senior. The survival strategy which has successfully navigated him through school thus far is to be an acquaintance to many and a friend to none, being on first name basis with all of the key cliques without declaring an allegiance to any. One day his mother (Connie Britton) breaks some bad news to him. A girl from his grade at school, Rachel (Olivia Cooke), has been diagnosed with leukaemia – the ‘Dying Girl.’ And then as only mothers can, she demands that Greg go over to Rachel’s house to be a friend and try and cheer her up. With time, what starts out as an uncomfortable arranged friendship becomes an honest connection between them. So that is the ‘Me’ and the ‘Dying Girl,’ which just leaves us Earl (RJ Cyler). Earl is Greg’s one real, long-time friend. Greg and Earl share a rather highfalutin taste in cinema, more Criterion Collection than blockbuster, and together they make films. Their oeuvre has a consistent method. They take a film that they like, make a stupid pun out of the title and then make a film that reflects the new title. It is a system that can only produce horrible films, but it amuses them so they keep using it. We see glimpses of their work – “A Sockwork Orange,” “My Dinner with Andre the Giant,” “Senior Citizen Kane,” and “It’s a Punderful Life” – and they never disappoint. Put together by Edward Bursch and Nathan O. Marsh who have both done art department and animatic work with Wes Anderson, the films feel like an Anderson infused version of the ‘sweded’ films from Michel Gondry’s Be Kind Rewind, while retaining the sense that they are products of teenage creativity. Rachel is the first person Greg has allowed to see their films, and as her condition worsens each new film becomes an important moment of respite and humour for her. This prompts Madison (Katherine C. Hughes) – the school’s intimidating hot girl – to make Greg agree to make a film especially for Rachel. But not knowing what the film should be, Greg finds himself crippled by the project. As silly as they are, Greg’s films represent his need to express himself and his struggle to make a film for Rachel is a symptom of his failure to truly understand and appreciate his feelings for her. 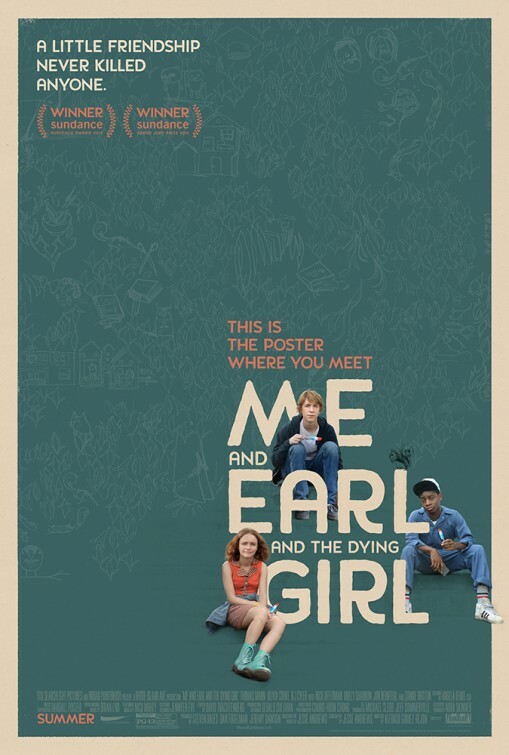 On the surface, Me and Earl and the Dying Girl sounds like another The Fault in Our Stars, a manipulative tear-jerker, a formulaic teen cancer romance tragedy. But Gomez-Rejon and Andrews avoid that path and create something uniquely touching. They know what we are expecting to happen and they play against that. There is nothing sexual about Greg and Rachel’s relationship, and through his narration Greg constantly reminds us that “this isn’t a touching romantic story” and we should not be waiting for the moment when their eyes meet and they start “furiously making out with the fire of a thousand suns.” Rather, we are given a more sophisticated relationship. Not all love stories are romantic. Not all love stories are sexual. This is a story about friendship, connectedness and intimacy. Greg is a specialist at superficial relationships. He even insists on calling Earl a “co-worker” rather than a friend. But he now finds himself in an extreme version of the situation he has always sought to avoid by never getting too close. Through this relationship with Rachel Greg learns to embrace the highs and lows that come with opening yourself up to another person. Gomez-Rejon impressively balances the film’s tone. It is genuinely funny without undermining the seriousness of its subject. It is touching and poignant without being schmaltzy and overly sentimental. It also has a distinctive visual style, mixing live action with moments of animation. Shot by Korean cinematographer Chung-hoon Chung, who is best known for his work with Chan-wook Park (Oldboy, Stoker), Me and Earl and the Dying Girl is always trying something through interesting angles and camera movements. Rather than distracting the viewer, this stylised aesthetic seems consistent with Greg’s narrational voice. He is a filmmaker, a storyteller, so he recounts his life in that dramatic style. The leads Thomas Mann and Olivia Cooke are impressive, but it is the supporting cast that really elevates the film. RJ Cyler is wonderful as Earl, who initially feels like a comic relief character but through his observant and perceptive nature becomes central to the growing intimacy between Greg and Rachel. Nick Offerman as Greg’s eccentric father and Molly Shannon as Rachel’s struggling mother bring laughs to the film while retaining their characters’ humanity. There is a lot in this film which makes it a treat for movie buffs. But as fun as all of that is, it is tangential. It is its heart and honesty that makes Me and Earl and the Dying Girl such a beautiful and affecting piece of cinema. When so often we throw our box office dollars at lazy sequels or uninspired franchise pieces just because we are worn down by marketing campaigns, Me and Earl and the Dying Girl is a wonderful independent film that truly deserves your money. Have you seen Me and Earl and the Dying Girl? Leave a comment and let us know what you thought. I definitely got that Wes Anderson vibe, too!!!! That’s probably what made that movie so great. I loved how the story was almost completely opposite from The Fault In Our Stars. I read the book and didn’t enjoy it as much as I did the movie. The screenplay was great improved upon. GO INDEPENDENT FILMS!!!!!!!! !